“Blueberry has done a magnificent job... the software does exactly what I wanted it to do." Daytrack UK trades in the retailing of currency pairs on the Foreign Exchange Market. The company needed a system that could follow and trade currency pairs for twenty-four hours a day, seven days a week. The software was required to constantly monitor twenty currency pairs, find trading opportunities according to preset parameters and enter those trades into the Forex Market Place. Furthermore, once the trades had been entered, Daytrack UK wanted the system to monitor them through their life cycle, and once spent, be taken out of the market, so that the company could bank any profits. 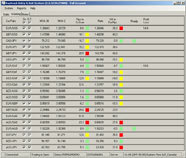 Without such a system in place, the company was missing a great deal of Forex trading opportunities. Blueberry developed an application in C# with Microsoft Visual Studio on the .NET platform. These technologies were particularly suitable for Daytrack’s requirements, allowing Blueberry to leverage the power of the .NET frameworks for the task of monitoring the price changes advertised by foreign currency exchanges. This allowed Blueberry to focus on the custom code that implemented Daytrack’s algorithms for determining when trades should be placed and when they should be closed. The software was required to monitor twenty currency pairs all the time and – following certain parameters – if trading opportunities arose, the software package would not only find these trading opportunities, but would enter those trades to the Forex Market Place. The trade entry & exit software application was successfully completed on time and is now up and running, allowing Daytrack UK to maximise its trading opportunities. 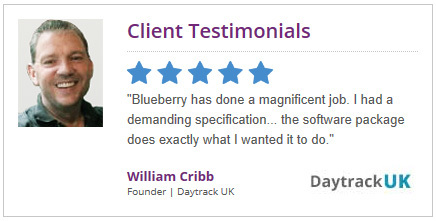 Owner and founder of Daytrack UK, William Cribb, said: “Blueberry has done a magnificent job. I had a demanding specification for the build, and the software package does exactly what I wanted it to do. “I’ve also enjoyed my working experience with the team at Blueberry Consultants and look forward to working with them again in the near future”.